Rachael Heyhoe Flint, the former England women's cricket captain, has died aged 77. Baroness Heyhoe Flint, vice-president of Wolverhampton Wanderers Football Club, passed away in the early hours of Wednesday after a short illness. She leaves behind husband Derrick, their son Ben, and her stepchildren Rowan, Hazel and Simon. Ben said the family was "deeply saddened". Heyhoe Flint captained England between 1966 and 1978. She also played in the first ever women's match at Lord's, against Australia, in 1976. During her career she played 22 Test matches and 23 one-day internationals. She was inducted into the ICC Hall of Fame in 2010. She also became a successful journalist, after dinner speaker and expert in public relations, which brought her back into contact with her beloved Wolves as she headed up the club's work in the local community. 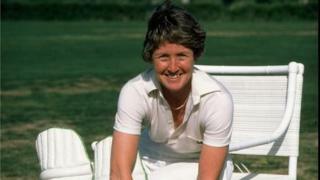 MCC president Matthew Fleming said: "Rachael Heyhoe Flint was a pioneer of women's cricket - she was the first global superstar in the women's game and her overall contribution to the MCC, cricket and sport in general was immense." Clare Connor, the ECB's director of women's cricket, said: "She was so special, so ever-present and now she has gone - but her impact can never be forgotten. "Rachael was one of our sport's true pioneers and it is no exaggeration to say that she paved the way for the progress enjoyed by recent generations of female cricketers." Among many others paying tribute to Heyhoe Flint was BBC cricket correspondent Jonathan Agnew, who said on Twitter: "Very sad news re Rachael Heyhoe Flint. Great champion of women's cricket, won first World Cup and one of life's real enthusiasts. #RIP." Flags were flying at half mast at Lord's and Wolves' Molineux stadium. The club's players will also be wearing black armbands at Saturday's Championship game at Norwich. Wolves managing director Laurie Dalrymple said: "Everyone at Wolves is deeply saddened to hear the news that Rachael has passed away. "She was a wonderful lady who meant so much to so many people at the football club, in the city of Wolverhampton, and also much further afield. "Rachael's contribution to the world of sport, the local community, and in later years politics, cannot be measured, and neither can her seemingly never-ending kindness and generosity of spirit." The England Cricket Board said her development of cricket had been "immense". When her playing career ended, Heyhoe Flint became one of the first women admitted to the MCC. In 2004 she became the first woman elected to the full committee. She was awarded the MBE in 1972, the OBE in 2008 and was made a life peer in 2011.